Andrew is a human rights advocate with a special interest in social protection and employment policy initiatives for people with disabilities. He has worked on inclusive disability policy with the United Nations, international organizations, NGOs, government and academia and has been published in this area by the International Labour Organization (ILO), the World Bank and the Georgetown Public Policy Review. 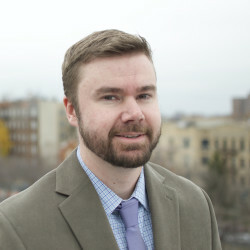 In addition, Andrew has a background in equitable employment policy with various international organizations. As a consultant, Andrew helped develop HIV/AIDS protections for land transportation workers with the ILO in Chile, and completed quantitative and creative data analysis in support of healthy work-life balance for the World Bank Staff Association. He is also experienced in legal drafting as a Legal Officer on employment policy conventions at the ILO in Geneva, Switzerland. Andrew’s regional focus is Latin America, having spent over four years living and working in Chile, Colombia, Costa Rica, Nicaragua, and Mexico. He has graduate degrees in Applied Economics from Georgetown University as an OAS Scholar, and International Law & Human Rights from the United Nations University for Peace as a Rotary Scholar.